I spend a concerning amount of time every week online window shopping. Unlike online shopping, online window shopping just involves browsing for hours without actually pulling the trigger on anything. I'll go through anywhere from net-a-porter to Forever21 just looking at cheap sundresses or $2,000 Dolce and Gabbana clip on earrings longingly before bookmarking them for the day when 3 billion dollars just falls out of the sky and hits me on the head. I have a whole folder of stuff like that, about 100 links deep of things I'm just never going to buy because 9 times out of 10 my window shopping results in nothing. I was browsing JCrew.com last weekend, as I do, looking at things I can't afford when I stopped dead in my tracks at the sight of these pants. 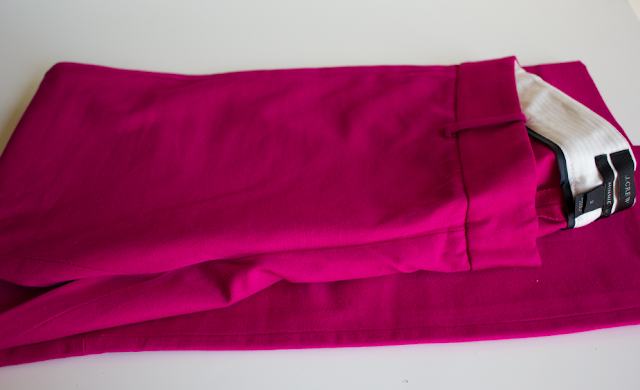 BRIGHT PINK J Crew Minnie ankle pants. I don't know if I've ever had such a visceral reaction to an item of clothing. I splurged on a pair of black Minnie pants around Christmas time and they're pretty life altering. They're thick, stretchy material that feels like you're wearing leggings but looks like you're wearing professional little Audrey Hepburn pants. No feeling disgusted with yourself like I personally do when I go to the grocery store in worn out, probably see through yoga pants even though I haven't done yoga since it was mandatory for gym class in high school. Just a polished, stylish look without compromising on the comfort and laziness factor. As you can see, I was passionate about these pants to begin with but in that color? That obnoxious, bright pink color? My all time favorite pants in a color that makes them look like they could hang in a closet in Barbie's dream house? Done. Sold. I don't care how much they are, I'm getting them. I actually totally cared how much they were. $90 for one pair of pants kind of makes me want to pass out a little. I ran to my two preppy, New Englandy, J Crew savvy friends to ask when they'd go on sale. In a sign obviously from some deity themselves, that day was the next day (!!!) when J Crew began their spring 25% off offer that runs until midnight on the 28th both online and in stores. Knocking over $20 off the price of these HAVE TO HAVE pants just a day after I love at first sight saw them was almost too good to be true. I actually went to the actual J Crew store to buy them because I just wouldn't be able to wait however many business days for these Jackie O Barbie doll pants to arrive in the mail. I don't think I've ever been in and out of a store so fast. I just walked in a direct line from the door to the table of Minnie pants to the register to the door again*. A sales associate asked if I needed any help and I was like, "NO! I KNOW WHAT I WANT! IT'S THESE BARBIE PANTS!" and she was like, "Oh, good, we have a 25% off deal- " and I was like, "I KNOW, I KNOW!! THAT'S WHY I'M HERE!! 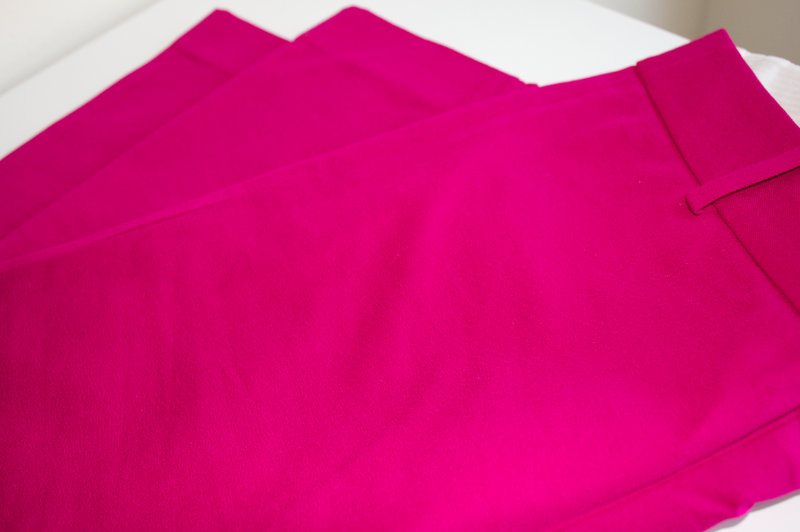 CHEAP PINK STRETCHY PANTS! I'M GOING TO BE CARMELA SOPRANO BARBIE!" The real life color of the pants is a lot different than the site. They look less neon pink and more of the "bright berry" that J Crew lists. "Florescent fuschia" is a pretty accurate description. A vibrant, deep pink. Unfortunately, I don't have any tips on how to style bright pants or anything because I plan on wearing them to everything, with everything. Glowing pink is a neutral to me, like glitter or leopard print. *That's another lie, I totally stopped in my tracks and kind of petted this cashmere striped sweated with BUTTERFLIES stitched onto the front before I was like, "Cool it, Vanessa, that's enough $60+ 13 year old girl purchases for the day" and then walked directly to the door.